Totally Kids Times wrote a sweet little piece titled Yesterday’s Sweater which showcased items made from upcycled sweaters! I’m very honored that they included a couple of my hats! Thanks Totally Kids Times! I wanted to share a How To that they also included in their post. 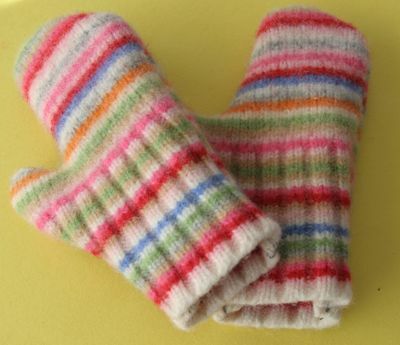 Dollar Store Crafts has a quick and easy picture tutorial on Dabbled for making quick upcycled sweater mittens! Don’t Heather’s mitten look great! Little Bit wouldn’t keep mittens on this year! If he picks out the sweater I’m sure he’ll be more interested in wearing mittens next year! This entry was posted in refashion, sweater, Tutorial, up-cycle, winter. Bookmark the permalink. Awesome project thanks for sharing!